We've probably all heard that biscuits and chocolate are not good for us, so why do we carry on eating them? What is it that makes us ignore the little chatterbox in our heads that says ‘Don't eat the cake!!!’? There can be a few things going on in our brains, but here we investigate one of the most common. 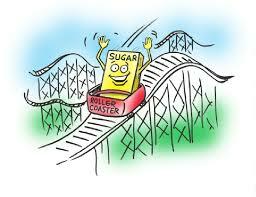 Sugar (the basic building block of carbohydrates) can cause havoc with our blood sugar levels. Many years ago, and for most of human existence, man has had very little in the form of sugar, (usually just honey and fruit). Carbohydrate intake used to be much lower and man was naturally more active. (No cars, computers, games, Facebook etc..) We’d have used fat for energy, either from our food or from our bodies. Food has changed dramatically in recent years, and so therefor have our waist lines. We are told that eating lots of pasta, bread and cereals is healthy and there are extensive shelves in the supermarket dedicated to biscuits and cakes! But nowadays we move around less and excess carbohydrates that aren’t used up as energy are stored as fat. Fruit juice, biscuits, white bread, sweets etc. cause a rapid rise in blood sugar, a large release of insulin, followed by a steep drop in blood sugar. The symptoms of low blood sugar can include headaches, irritability, low mood, energy slumps and cravings – usually remedied by another cake or biscuit which repeats the pattern. Getting blood sugar and insulin more stable is answer…..
To Resolve? Lower your refined carbohydrates and increase your protein and healthy fats. Instead of having cereal for breakfast, have something like eggs, smoked salmon – slightly longer to prepare but you’ll make it to lunch without snacking. If you must eat between meals, make it a bit of chicken or a boiled egg. Apply these rules to lunch and dinner and keep alcohol intake low in the evening as this and a bad night’s sleep can also affect blood sugar. Slow release carbs like non starchy vegetables are good. And here’s an incentive for you – when your insulin is high you will not burn fat. We are all different but these points are worth trying first if you suffer from snack attacks and energy slumps.